Reports like those that follow help make it clear that the problems we face are structural rather than cyclical. Myriad bad policies and a distorted sense of economic reality — no doubt fed by ruthlessly self-interested corporate and political interests — encouraged large numbers of Americans to acquire knowledge, skills, and perspectives that are really only relevant in an easy-money-fueled economy. Once the bubble bursts, however, they are as unprepared for changing times as a proverbial fish out of water. And yet, we still have a growing chorus of mindless Keynesians, ivory tower economists, Wall Street strategists, and assorted other pseudo-experts pushing for more stimulus, more borrowing, more tax cuts — more of the hair of the dog that bit us to begin with. If government is going to do anything at all — which seems inevitable, like it or not — wouldn’t it be better if the those in charge focused on telling people the cold, hard truth about where things stand; directed efforts towards helping Americans adjust to a new operating environment, instead of the one that is not coming back; and, rejigged policy incentives — like those that favor borrowing and homeownership — in ways that might prove more beneficial in the long run? Oh well, we can only dream. As the United States continues its battle with high unemployment, policy makers are confronting a troubling question: What if they’ve been taking the wrong approach to fixing the ailing job market? Some prominent economists and policy makers are…suggesting the real problem isn’t lack of consumer spending – it’s that the unemployed don’t have the right skills to fill the jobs that are open. These people are now theorizing that the financial crisis has altered the structure of the U.S. labour market, perhaps permanently. 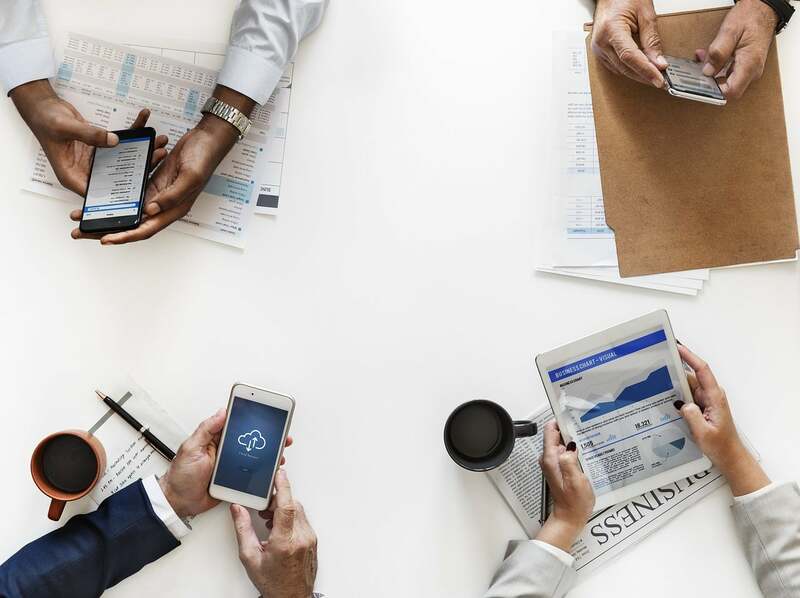 If they’re right, the Obama administration and the Federal Reserve will need to change their approach to increasing employment because their current one, which is aimed at stoking spending, could end up exacerbating the conditions that led to the financial crisis. Inquiring minds are reading the Economic Policy Journal for clues on how much states are borrowing to make unemployment insurance claims. The totals are not pretty. As of May 20, the total balance outstanding by 32 states plus the Virgin Islands is $37.8 billion. The CINN Group accounts for $14 billion of it. The worst 4 grouping accounts for $17 billion, nearly 45% of the total. I bet the entire amount is forgiven. Any takers? Note that the Emergency Unemployment Compensation (EUC) Extended to June 2, 2010 is about to run out. The Public Policy Examiner reports Unemployed must wait for Congress to preserve benefits. A vote on a new end for unemployment benefits will not come until next week. On Thursday morning, Sen. Max Baucus (D-MT) and Rep. Sandy Levin (D-MI) proposed amending H.R. 4213 to extend benefits until December 31, 2010. The amended bill, American Jobs and Closing Tax Loopholes Act, would extend COBRA health benefits until the end of the year. Other plans accompany the benefits extension effort. Rep. Bob Filner (Dist. 51) plans to help San .Diegans in economic trouble by passing George Miller’s Local Jobs for America Act. Filner says the city would get 3,263 jobs, with more jobs expected in the other county communities. The bill targets communities with high unemployment. Rep. Susan Davis (Dist. 53), on Wednesday, was one of three legislators introducing the COBRA Health Benefits Extension Act, H.R. 5324. The unemployed could receive COBRA benefits past the standard 18 months, as long as they needed. At least until Obama’s health exchanges arrive. Damn, I am sure glad there is a nascent economic recovery. Otherwise, who knows how bad this could get. The Senate approved yet another plan to stimulate the economy. It’s called throwing $33 billion at homebuilders. This is of course doing nothing but giving money to the greedy pigs that helped create this mess. However, that is the way Washington works. Senate Majority Leader Harry Reid even had the gall to brag about it. Please consider Senate Approves Extended U.S. Homebuyer Tax Credit. The U.S. Senate approved a $45 billion plan to expand a tax credit for first-time homebuyers, extend jobless benefits and provide tax refunds to money-losing companies. The plan would be the first major extension of provisions in February’s economic stimulus plan. The $8,000 homebuyers’ tax credit, slated to expire this month, would continue until April 30 and be expanded to include people with higher incomes and some who already own homes. That would cost about $10 billion in the fiscal year that began Oct. 1, according to Congress’s Joint Committee on Taxation. “Republicans used every trick in the book to slow and stall and ensure we can’t do important work,” Senate Majority Leader Harry Reid, a Nevada Democrat, said today. Lawmakers are still considering whether to extend several other elements of the stimulus package, including subsidies to help the jobless buy health insurance and increased funds for food stamps. Obama has called for sending seniors $250 checks because they won’t get a cost-of-living increase next year in their Social Security checks. For the first time, the average amount of time it takes fired employees to find a new job exceeds the length of their standard unemployment benefits. The CHART OF THE DAY shows the average duration of unemployment is now 26.2 weeks, longer than the 26 weeks of state benefits normally provided to workers who lose their jobs. It’s the first time that has occurred since the Bureau of Labor Statistics began keeping records in 1948. The jobless rate rose to 9.8 percent in September, while payrolls fell by 263,000, a Labor Department report showed today in Washington. 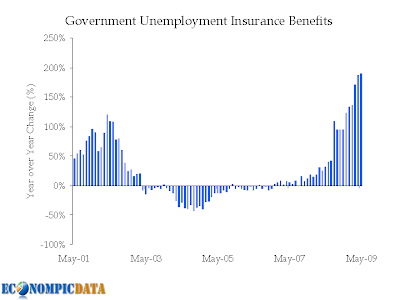 Congress has extended unemployment benefits twice — first in July 2008 and then as part of the stimulus bill signed in February. Currently, the unemployed are eligible for a total of 46 weeks of benefits, and those in states where the unemployment rate is more than 6 percent are eligible for 59 weeks. Those additional benefits expire at the end of the year, and about 1.3 million people will exhaust them by then, according to the National Employment Law Project. 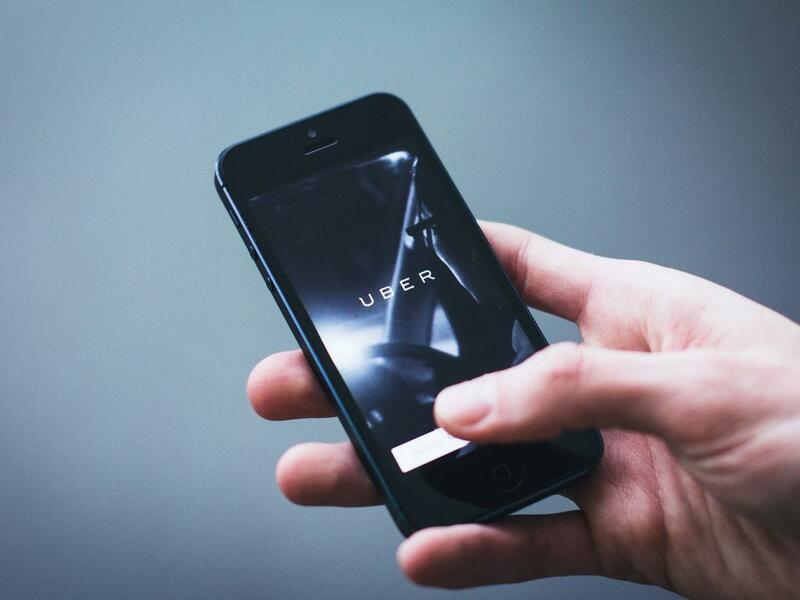 An extension of benefits, which was passed by the House of Representatives, is being held up in the Senate by lawmakers who object because their states would be excluded from the plan. The purple line on the chart shows 5.4 million people have now been out of work for at least 27 weeks, representing 35.6 percent of the total number of unemployed, the most since the agency began keeping statistics in 1948. Here are Jake’s information-loaded charts showing that May’s increase in income reflects an increase in social benefit payments – unemployment benefits doubled in the last year. The income of Americans soared in May because of the government’s economic stimulus, leading them to increase spending modestly and boost the saving rate to the highest in 15 years. Personal income rose at a seasonally adjusted rate of 1.4% compared to the month before, the Commerce Department said Friday. The jump reflected reduced taxes and increased social benefit payments unleashed by the stimulus package. Up? Yes. Soared? No. 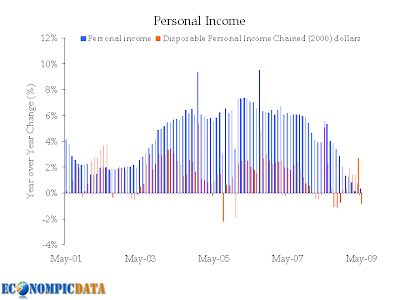 Looking at year over year figures, personal income continues to show anemic (or in disposable personal income terms negative) growth. Was stimulus the savior? Well, if you classify unemployment (and the extension of these benefits), then yes. The amount of unemployment benefits paid out has doubled in the past 12 months. The chart below shows this more clearly. 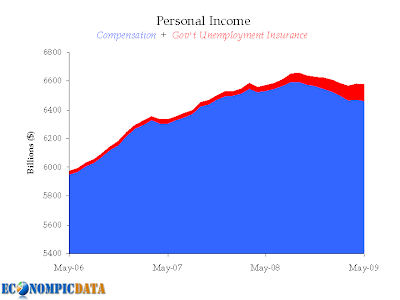 While personal income has stabilized, it has been due to unemployment benefits making up the shortfall in compensation. They key is what happens now. Unless benefits are extended again (and soon), these figures will turn negative unless you believe the broader economy picks up. There already have been negative signs as the exhaustion rate (i.e. those no longer able to collect benefits) has increased in recent months.